One of my most favorite candies! I didn’t grow up on these but I started receiving them when we moved back to Oklahoma. My great Uncle made them and I looked forward to receiving that bag each year. We don’t receive them anymore, but that doesn’t stop me from making my own. My first hard candy experience last year, was not the best. I was too cheap to buy the candy thermometer [because I thought it was expensive, it was $4!!] and a couple of batches just did not turn out well at all. Hitting hard crack temperature takes time and the sugar is very sensitive to being over or under. Chewy candy made me angry many times last year. I don’t suggest letting your littles participate in this one since it involves molten hot sugar. I kept my little guy out of the kitchen until I was into the “let it stand” point of the process. I have a little bit of both forms as I am still practicing those pretty squares. 1. In a large pan, combine Sugar, Water and Corn syrup. Bring to a boil over medium heat, stirring occasionally. 2. When it begins to boil, cover for 3 minutes. 4. Remove from heat. Stir in oil and food coloring, I don’t suggest inhaling, the cinnamon is strong. 5. Quickly pour into a greased pan, about 13 in. x 9 in. 6. Let stand for 5 minutes. 7. If you desire square cut candy, after 5 minutes, begin to score the candy into 1 in. squares, repeating as many times as necessary, using a sharp knife [use a pan that can be cut, this will ruin a non-stick baking pan]. 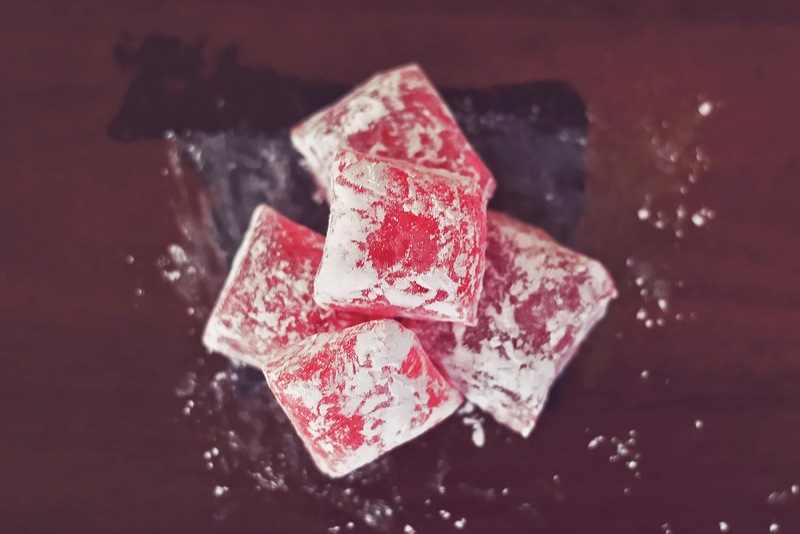 Once squares hold shape, leave candy to sit until dry, about 1 hour. 8. If you desire glass candy, don’t cut it, just let it dry for 1 hour. 9. Once candy is dry, flip pan over a clean surface. The candy should fall out on it’s own, if not, tap pan until it begins to fall out. It’s okay if the candy breaks apart, that’s what you want. 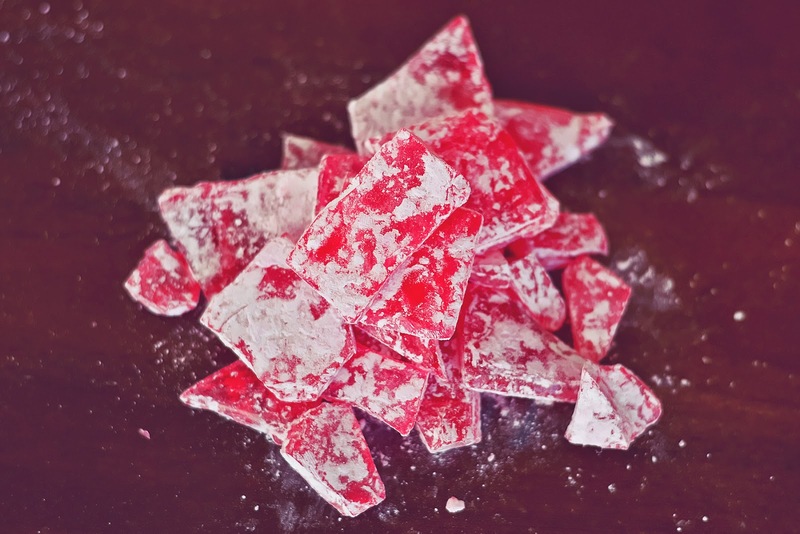 Break squares apart or break candy into various pieces for glass candy. 10. 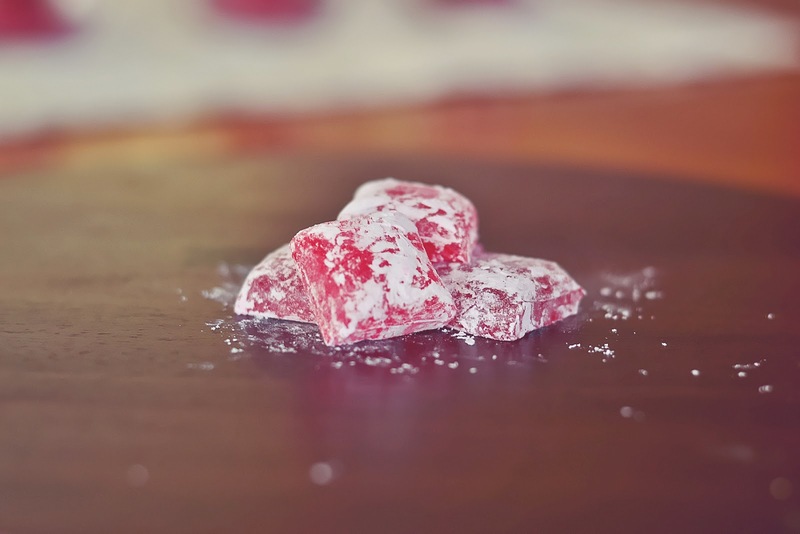 Put candy into a ziploc bag and add powdered sugar, shake and store.